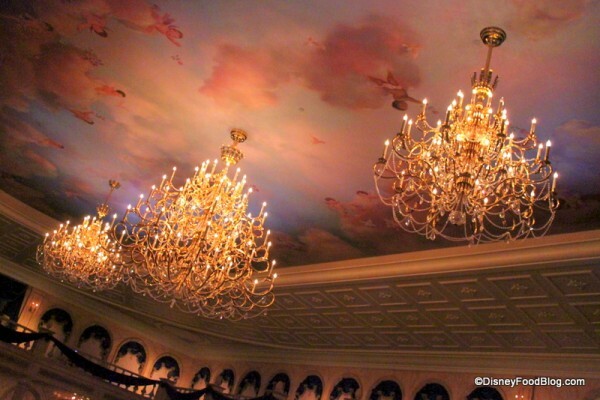 Be Our Guest in the Magic Kingdom - visit for lunch. One of the most difficult tables in the Kingdom to get, Be Our Guest Restaurant in New Fantasyland is right out of the movie. Lunchtime at this Beauty and the Beast themed restaurant is home to Walt Disney World's most unique quick serve. The classic beauty of the ballroom is enchanting, but I'm told it can get quite loud. Try for a table in the dimly lit West Wing where the fantastic theme continues. Tangerine Cafe in Epcot - visit for dinner. 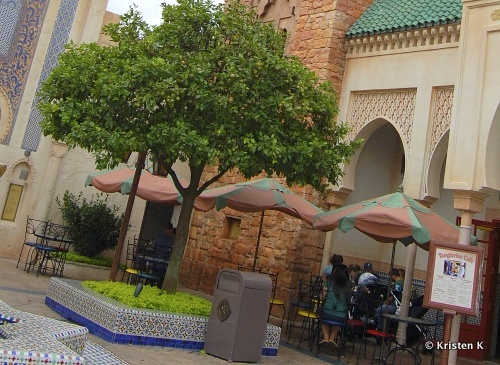 The courtyard of the Morocco Pavilion is stunning after dark, the lighting in the courtyard and the soft sounds of the fountain near the Tangerine Cafe make it my pick for a most romantic atmosphere. When the trees are in bloom the sweet scent of the flowers fills the air, and if you're lucky you'll be able to catch a musical performance across the courtyard. Stop by the Tangerine Cafe and share of plate of schwarma with your sweetie. Don't forget some of the delicious baklava for dessert too, it's a Honey DO. An honorable mention here has to go to La Cantina de San Angel for its waterside seating and cafe lights. Grab a table along the rail an hour before Illuminations and enjoy some margaritas in the moonlight. Yak & Yeti Local Food Cafes at Animal Kingdom - visit for dinner. 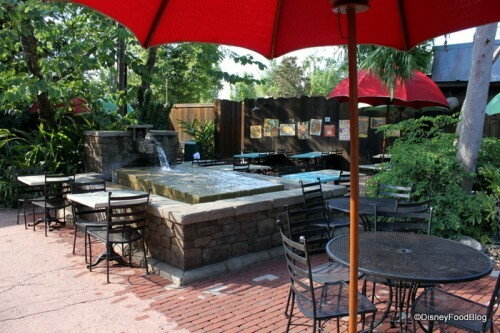 The water garden behind Yak & Yeti makes for a lovely romantic spot to grab a bite to eat. Pick up your favorite Asian foods at the Yak & Yeti Local Food Cafes and head on back to courtyard to snag a table for two next to the fountain. The food here is the same as you can get inside at the table service restaurant, which means you get fantastic flavors for a value price. The cafe lights overhead lend a dreamy feeling to the area after dusk, and it's a sweet spot to relax with a Yak Attack cocktail. Make A Picnic at Disney Hollywood Studios - visit for lunch or dinner. It's rough to be a young couple just starting out, but Disney's Hollywood Studios is a grab place to embrace the dream of things to come. Make your own picnic for a romantic and memorable meal. Grab your lunch to go from the Studios Catering Company and make your way to the Streets of America. 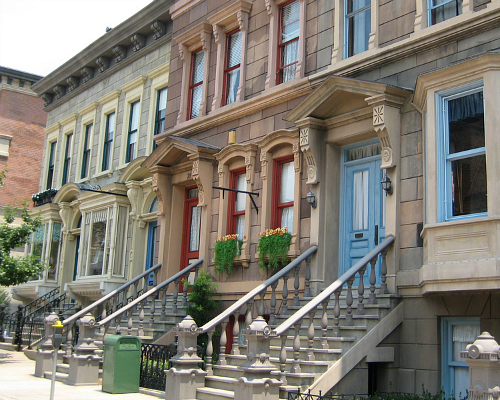 There amongst the urban set you'll find a series of cute doorsteps and stairs, pick your favorite one leading up to "your" townhome and picnic on the stoop. Not only is it the perfect place to talk of all your dreams, but you can come back to visit year after year. 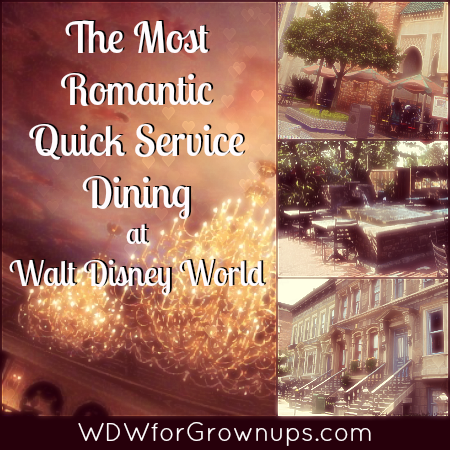 Thanks so much to our friends over at the Disney Food Blog for use of their images today. True romance is all about being with the one you love, but a fantastic atmosphere goes a long way to elevate a regular table to an exceptional experience. What Quick Service spot would you add to the list? Leave a comment and let me know! Flame Tree BBQ down by the water. We've usually been lucky enough to be the only ones that venture that far from the counter. It is so nicely surrounded by trees that you really can't see many other people. We have never been to Yak & Yeti when it hasn't been super crowded. Not romantic at all. We'll have to stop after dark and check it out! Great pick JoAnn! From what I understand of the upcoming Rivers of Light show that waterside seating may include a view of the show. Hence the current refurbishment going on at Flame Tree.